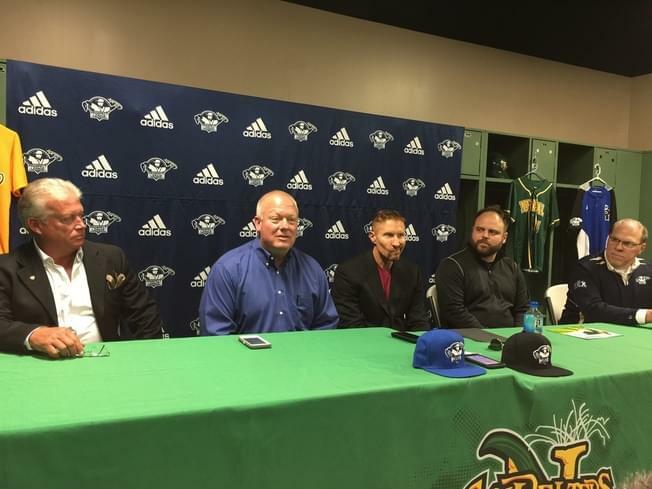 NORMAL – After nine years as a professional baseball organization, the Normal CornBelters are turning to one of the top summer collegiate leagues to continue play, and are doing so under new ownership. The CornBelters announced Monday the team will join the Prospect League beginning with the 2019 season. The Belters were in the independent Frontier League since the team’s first season in 2010. The team’s new owners are already involved with the Prospect League. Co-owner Rick DeStefane is the owner of the Hannibal Hoots and is joining forces with the owner of longtime baseball franchise Quincy Gems, Jimmie Louthan. DeStefane said the Prospect League is considered the Number 3 summer collegiate league out of more than 30 such circuits in the country, with many players eventually entering Major League organizations. DeStefane said about 90 Prospect League players were drafted by Major League organizations over the past three years. DeStefane pointed out the Prospect League has advanced well beyond the roots of its predecessor, the Central Illinois Collegiate League, with more of a professional feel found in minor and independent leagues. Prospect League Commissioner Dennis Bastien said the level of facilities as well as the image of the league is continuing to improve. Steve Malliet, the team’s principal founder and general manager, will remain with the CornBelters according to DeStefane, who added that a head coach has been hired and will be announced later. The Prospect League uses wood bats and plays a 60-game regular season with 30 home dates. Play begins in late May and continues through early August.